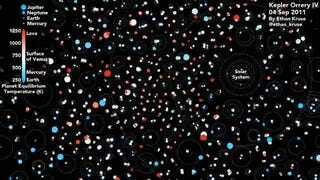 NASA’s Kepler space telescope spotted thousands of worlds during its four-year mission, proving that our galaxy is filled with planets. But even more surprising is what the Kepler database highlights about our own solar system: namely, that we’re a bunch of celestial oddballs. That fact is made obvious by Kepler Orrery IV, an animation produced by astronomy graduate student Ethan Kruse of the University of Washington. In it, Kruse compares the orbits of hundreds of exoplanets in the Kepler database to that of our own solar system, shown on the right. The animation indicates the relative size of the Kepler planets (although obviously not to scale compared with their stars), as well as their surface temperatures. Once you get over the hypnotic effect of all those twirling dots, you’ll start to notice just how strange our planetary choreography is. Before the Kepler mission began in 2009, astronomers assumed that most exoplanet systems would be constructed like our own: small rocky worlds toward the center, large gas giants hovering around the periphery. But when scientists started detecting planetary transit events en masse, we realized we weren’t being nearly imaginative enough. One theory posits that our Solar System once harbored a primordial clan of planets on tight, but unstable orbits. Perhaps these luckless worlds fell into the Sun or were flung violently out of the Solar System long ago. “It’s still too early to tell, but these very compact Kepler systems are definitely helping us refine our theories about planet formation,” Kruse said. Kepler Orrery IV—the “sequel” to the Kepler Orrery series produced over the years by the University of Santa Cruz’s Dan Fabrycky—shows all of the Kepler multi-planet systems to date (1705 planets in 685 systems). Kepler’s primary mission ended in 2013 after the space telescope lost two of its stabilizing reaction wheels, but the trove of information it collected has continued to yield discoveries ever since. Kruse, for his part, hopes to continue sharing science and data with the public through clever animations, so we’re excited to see what he cooks up next.